Protect the bottom and sides of your Sony Alpha A7S II, A7R II, or A7 II camera with the stylish, brown Ever Ready Half-Bottom Protective Leather Case from MegaGear. Handcrafted from genuine leather, the case has a non-slip texture for an improved grip. This tripod-friendly case attaches to your camera's tripod socket. The bottom of the case has a snap closure door for easy access to the battery compartment. Box Dimensions (LxWxH) 7.0 x 3.5 x 3.4"
Ever Ready Half-Bottom Protective Leather Case for Sony Alpha A7S II, A7R II, A7 II (Brown) is rated 5.0 out of 5 by 1. Rated 5 out of 5 by Darryll from Great item! Well built! Fits perfectly on my Sony a7ii! Does this fit the new a7riii or a7iii? No, this one apparently not. However, MegaGear on their site is listing cases for the a7R III and a7 III. Hopefully, B&amp;H will be selling them soon. Does this fit Sony FE 24-105mm f/4 G OSS Lens? The item I purchased was only the camera base cover. 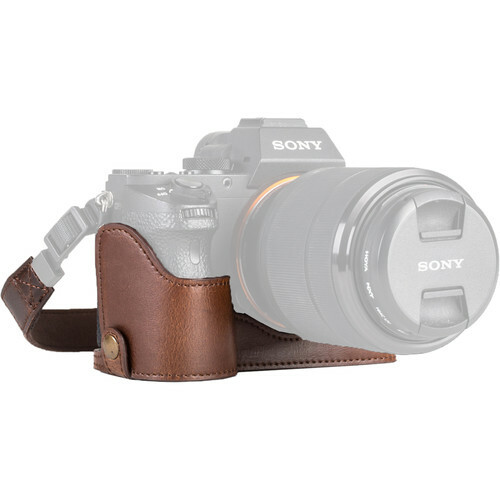 It only protects the Sony mirrorless camera, not the lens. Also provides a better grip since the Sony is so small.